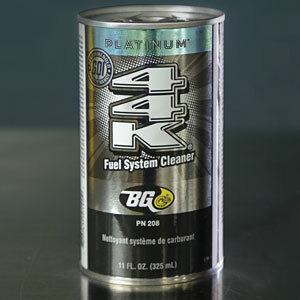 BG 44K® Platinum™: Legend in the making | BG Products, Inc.
What’s the difference between BG 44K® Platinum™ and a fuel system cleaner you can pull right from the shelf at any gas station? Some may say “price.” But we know better. Be wary of the low priced offerings at the gas station. Price is not the only difference. Let’s just say, you get what you pay for. BG 44K® Platinum™ is the highest quality product and it comes with free lifetime fuel system protection. BG 44K® Platinum™ upholds a standard of quality that’s unsurpassed in the automotive aftermarket. It delivers powerful cleaning to the entire fuel system, vanquishing deposits and restoring performance. Over decades of engine technology developments, BG 44K® Platinum™ has maintained its legendary status. Through testing, upgrading and reformulating, BG 44K® Platinum™ continues to quash doubts with proof of performance and staying power. Simply put, it’s the best. The Can. The Myth. The Legend. With something so great, so legendary, how could we ever come up with something better? BG 44K® Platinum™ is a response to modern engines’ need for even better clean. Deposits in newer gasoline direct injection (GDI) engines are getting tougher and tougher to remove. This new BG 44K® Platinum, with its advanced chemistry, is formulated specifically to address next-gen GDI. As part of the BG Platinum™ Fuel System Service, BG 44K® Platinum™ not only offers customers a clean fuel system, it also offers up to $4,000 in fuel system coverage. This once a year service offers fuel system protection for life. Can a $3 bottle of gas station “fuel system cleaner” do that? Ask for BG 44K® Platinum™ at your next visit.